From violent volcanoes to terrifying twisters, you never know when disasters will strike. The Federal Emergency Management Agency (FEMA) protects and serves Americans during emergencies. A significant part of their mission involves emergency preparedness. Unfortunately, many individuals and companies remain complacent when it comes to emergency preparation. FEMA statistics show that up to 60 percent of Americans have not practiced what to do in a disaster. This is one reason that 40 percent of businesses never reopen after disaster strikes. In fact, only 29 percent of businesses are still operating two years after the disaster. These alarming statistics should galvanize us into preparing for an emergency. Justrite emergency preparedness cabinets help ensure you are ready for disaster. What Should Be Stored in Emergency Storage Cabinets? 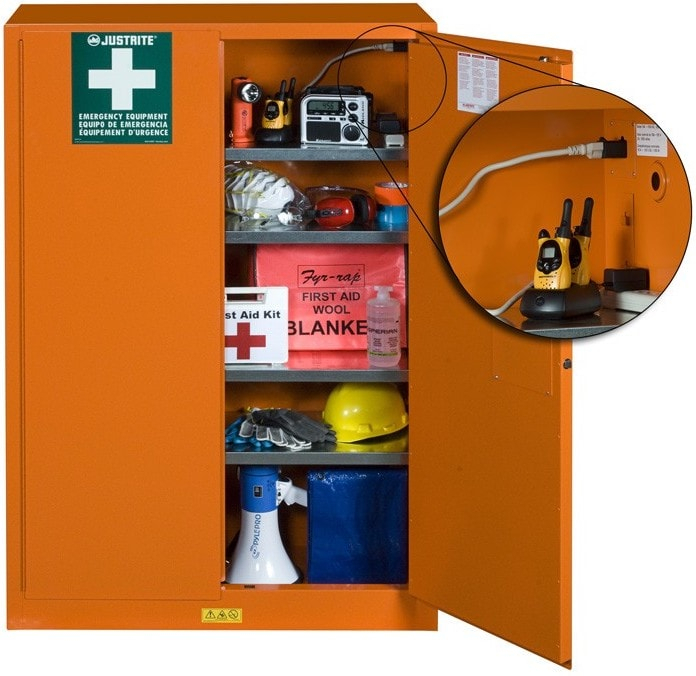 Justrite supplies emergency cabinets to store safety and emergency equipment. This includes personal protection equipment (PPE) like hardhats, safety goggles and gloves. Luminous vests and flashlights are important in case of power loss. Keep 2-way radios and/or walkie talkies for communication purposes when members of the group get separated. Locate emergency storage cabinets at different spots in your facility. Accessible first aid materials enable treatment of injuries during an emergency. In the case of fire or chemical release, respirators can save lives. Other suggested emergency supplies to store include batteries, food and water packs, spill kits, blankets, caution tape and basic tools. What are the Features of an Emergency Storage Cabinet? To avoid confusion with other cabinets, emergency storage Justrite cabinets are bright orange. They feature GloAlert™ glow-in-the-dark reflective labels that are visible even during power outages. Emergency storage cabinets also provide fire resistance and seismic protection. Justrite’s three-point stainless steel latching system provides secure closing and locking mechanisms. Yet, it is easy to open in an emergency. The spacious design features four adjustable shelves for storing emergency supplies. The Justrite PowerPort™ emergency preparedness cabinet has electrical pass-through connections. This enables charging of radio and flashlight batteries inside the cabinet. It comes with an external 9-foot power cord, which is 10-amp rated. Inside the cabinet is a 38-inch cord with a 6-outlet power strip. Justrite’s emergency cabinets meet NFPA codes and are backed by a 10-year limited warranty. You may not know how you’ll handle a disaster until you face one. But, having emergency supplies in one accessible location is an important first step. Don’t become a FEMA statistic and risk losing your business in a disaster. Get equipped with emergency cabinets today. Forbes. Will your business recover from disaster?